A sturdy crate is crucial if you own a dog and want to ensure it’s safe transportation. Here, we review the Petmate Vari-Kennel Dog Crate, a product which comes in a variety of sizes to suit small, medium, and large-sized dogs. While slightly more expensive than some dog crates on the market, if you’re in need of a sturdy design and a product that is built to last, this works on a lot of levels. For many owners, it can be confusing searching online for the best dog kennel or crate. There are a lot of things to consider. Is it the right size? Will my dog be happy in the Petmate Vari-Kennel? Are there any disadvantages to owning this product? This review will look closely at the features. If you’ve come to this page to buy this product, you can do so by clicking the link below. If not, keep on reading, and we’ll give you the information that you require to make a well-informed decision. CLICK HERE to Read What Amazon Customers are Saying About this Crate! 1.2 What Sizes and Colors Are There? There are many reasons why Petmate so often gets good reviews for their products. This plastic dog crate is both lightweight and durable. It’s also available in a range of sizes that suit almost any dog breed. This is a kennel that is ideal for both putting indoors and outdoors, as well as for transport. It’s often placed in the trunk and on back seats of cars. That’s because it provides a secure environment for keeping dogs of all sizes in a vehicle. It’s chrome steel door, and hard plastic body makes it one of the more durable models on the market at the moment. If you need to secure it in your car, there’s a notch at the top through which you can put a seatbelt. On the whole, this plastic dog crate is both functional and design-friendly. It’s great for in the home and strong in your car. There is some dispute about its suitability for travel on airlines, something we’ll cover in more detail below. We’ll also take a look at everything to do with Petmate Vari-Kennel so you can decide whether it meets your needs or not. CLICK HERE to Buy the Petmate Vari-Kennel Plastic Dog Crate on Amazon! If you’re looking for a reliable U.S. brand in the pet product arena, Petmate is near the top of the tree. They’ve been around for over 50 years, so that tells you something about their success and durability. Employing people who love pets means it’s a company that is passionate about providing great products. In recent times, they have developed an eco-friendly approach as well. It’s something that many pet owners appreciate and which has now become a part of their brand. What Sizes and Colors Are There? There is a variety of different sizes to choose from. If you are unsure which one to buy, you should measure your dog. First, measure from the top of the head to the floor. Your ideal kennel height should be at least a couple of inches more than this. Next, measure from the tip of the does to the base of the tail. Again, you need leeway of about 5 to 6 inches, so your dog has plenty of room to move around. The smallest Vari-Kennel is 21″ L x 16″ W x 15″ H and suitable for pets such as miniature dogs. The largest crate is 48″ L x 32″ W x 35″ H and is suitable for dogs between 90 and 125 pounds. Color combinations can vary between different sizes. The smaller crate comes in bleached linen or true blue while others are in taupe and black. With any kennel or dog crate, there are going to be plus points and maybe a few negatives. The Petmate Vari-Kennel is generally considered a good, safe bet when it comes to strong build and a variety of applications. For a start, it’s suitable for both indoor and outdoor home environments. If you want a permanent space for your dog or pet, it easily fits the bill. The plastic dog crate also works well if you need to transport your animal. The smaller ones have handles, and the larger ones are great for fitting on seats and in the trunk of vehicles. Here’s a quick look at the main pros and cons for the Petmate Plastic Dog Crate. This is an easy-assembly crate, and you don’t need any tools to put it together. It’s been designed with comfort and safety in mind. The wire vents provide plenty of ventilation for your dog whether at home or on the move. It’s made from recycled material which will impress eco-friendly minded customers. The firm plastic base and surrounds are very easy to clean. It has holes and notches to tie down for better security in transit. The latch on the door is easy to open one handed but secure enough to keep your pet inside. The current model is considered suitable for most internal flights in the US, but Petmate advises you check before traveling. Some reviews for the Petmate Vari-Kennel have pointed out that there is no ventilation in the back. This made it unsuitable for airline travel because you need ventilation. This was a problem with earlier models of the plastic crate but has now been rectified by Petmate. All current sizes of the kennel now have 360-degree ventilation, so you don’t need to worry unless you are buying second hand. Some reports have stated that it’s difficult to stick the ‘live animal’ stickers on the crate when traveling by airline. The measurements for the kennel are based on the outside size so you need to take this into account when making your choice. If you travel frequently, then the Sherpa Original Deluxe Pet Carrier may be a better option for you. It is recommended by the Delta Society, Humane Society, the ASPCA, and Veterinarians, for the safety and functionality of airline travel. The Petmate Vari-Kennel has proved popular with many dog and pet owners. The smaller varieties are suitable for taking into the cabin on flights. As a dog carrier or kennel, the material used in manufacture is durable and long lasting. Whether you have a small or large pet, there is certainly a size to suit your needs. The door mechanism is secure, and there’s plenty of room to move around, even for larger dogs. This is a good choice whether you travel a lot or want a dog kennel at home that you can use indoors and outdoors. It’s handy to take a closer look at what people are saying about any product online. The Petmate Dog Crate has been bought by a lot of pet owners over the years, and it remains one of the best-reviewed items on show. Getting used to the crate seems to be a big priority for many dog owners. Even pets with some anxiety about enclosed spaces can be trained to go in and out of the kennel as long as you choose the right size. One customer pointed out how his anxious Pitbull is just beginning to come to terms with its kennel after weeks of patience. 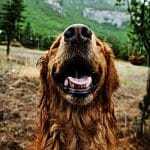 One of the problems with over anxious dogs is that they can tend to gnaw and bite at their carrier or kennel. The verdict seems to be that this is a lot harder with the Vari-Kennel and the damage that you find with other products in this category is largely avoided. The ability to secure the kennel while in transit is another plus point for buyers. There are points on the frame where you can put in zip ties for extra security and the crates work well with safety belts in cars. Many customers bought the Petmate Dog Crate for camping and like the fact that it can be easily secured. Some customers have been slightly fooled by the measurements, and all buyers need to take this into account. The measurements provided are for the external dimensions of the crate which means you have to take this into account when making your choice. This is particularly true if you are choosing a crate for a larger dog and want them to have plenty of room. The crates are now suitable for airline travel internally in the USA. Some reviewers have also pointed out that they are also suitable for international travel, though you will still need to check with specific airlines. As with most crates and kennels, you have to be extra careful if you have a dog that is either aggressive or doesn’t like enclosed spaces. While the Petmate Vari-Kennel suits most animals, it still may not be able to stand up to the most aggressive if they are continually biting and chewing. You should bear this in mind when training your dog to accept the kennel. This is a well-liked product with plenty of positive reviews. The Petmate Vari-Kennel Plastic Dog Crate comes in a range of different sizes and is an excellent choice if you travel a lot or need to take your animal on a flight. 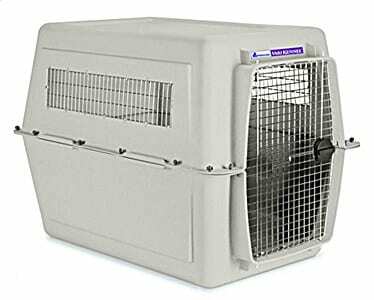 Past problems with its suitability for airlines now seem to have been resolved, and this remains a good quality dog kennel/crate that is suitable for home as well as for long journeys. It’s well worth a closer look. CLICK HERE to Order This Highly-Rated Dog Crate on Amazon!